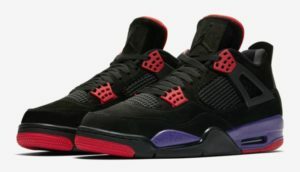 Jordan is releasing the Jordan Retro 4 in a Raptors colorway to a limited number of retailers on Saturday August 18th. This colorway, based off the sneaker head favorite Retro 7 of the same name, will undoubtedly be an instant classic and sought by collectors. Incidentally, we will be incredibly disappointed if we don’t get some paparazzi pics of Drake rocking a pair.